I would like to begin by expressing how proud I am of myself for this one. I measured, I timed, and I took lots of photos for this recipe. Truthfully, in the past, I estimated what I may have cooked with, I guessed on some times, and I didn't take very many pictures. 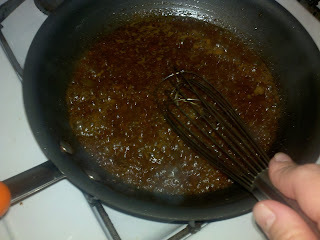 But, I am in the process of trying to start writing my own cookbook, so I figured I should start doing things correctly! Whisk all of the ingredients (except the white wine, you'll use that for deglazing later) together in a medium-sized pyrex dish. Use your judgement, just make sure the dish is large enough to hold two 8-oz. portions of your favorite steak. I used New York Strip, but Flank Steak works really well here, too. 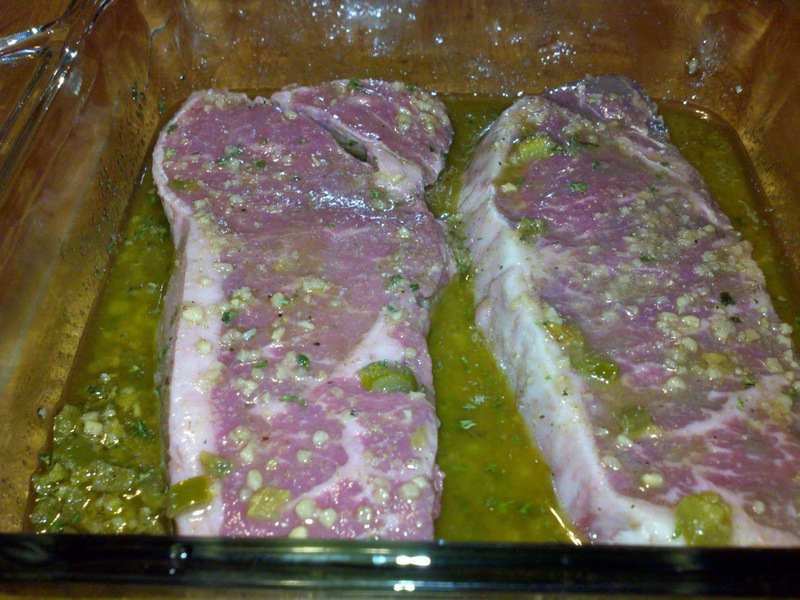 If you have the time, cover, and marinate your steaks overnight. If not, cut small slits in the steak, and marinate them for about 20-30 minutes. The slits help the flavors from the marinade sink in as deep as they can in 30 minutes. 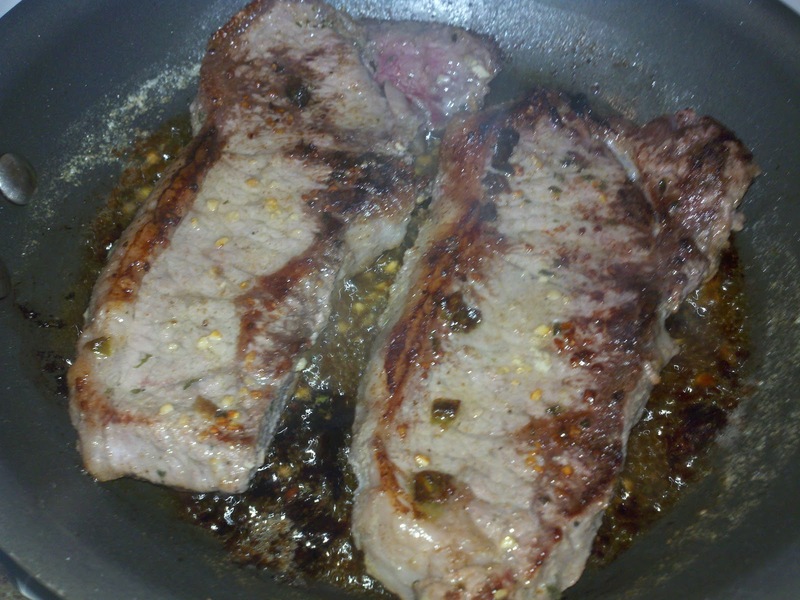 When the steaks are ready for searing, melt a tablespoon of butter over medium-high heat, and make sure you have an extremely hot pan. Drop the steaks in, and sear for 4 minutes on each side. This will give you a very pink, medium-rare center, which is the way I like my steak. If you like it more towards medium-well, sear for 6 minutes on each side, or use a meat thermometer and cook until the center of the steak is 150-degrees. When you flip your steak, you should see a nice char on the outside. When it is time to come out of the pan, make very sure you allow your steak to rest for about 5-10 minutes. If you slice your steak as soon as it comes out of the pan, all of the flavorful juices will run out all over your board, and then the marinating process just became null and void. And who likes to waste their precious time, really? 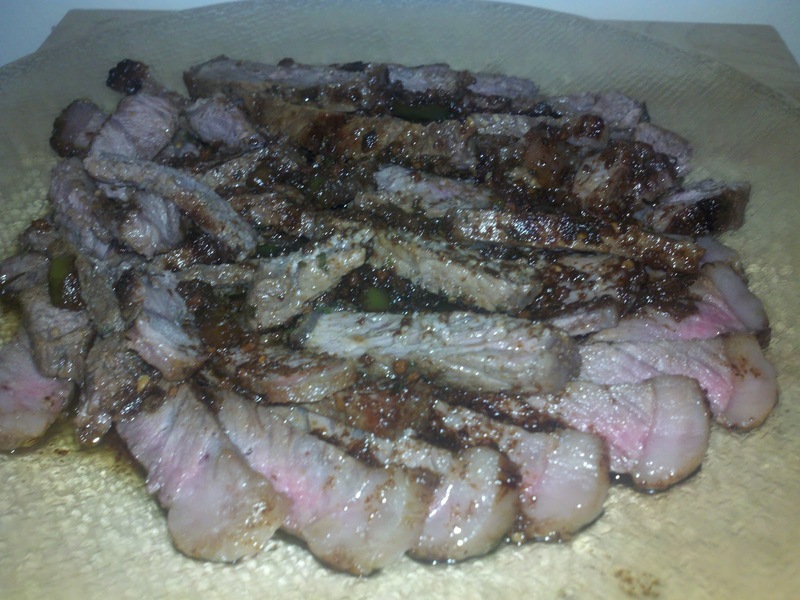 Thinly slice the steak, arrange on a plate, and pour the simmering marinade over top of the meat. If you have it on hand, roughly chop some cilantro, and sprinkle it down over the top of your steak. You are now ready to put together your burrito! Your favorite salsa. For this, I used my own homemade tomatillo salsa. I love salsa verde, too. First, I mixed the sour cream, cumin, onion powder, and cayenne pepper together. Then I spread this on my burrito, and topped it with shredded cheese and salsa. 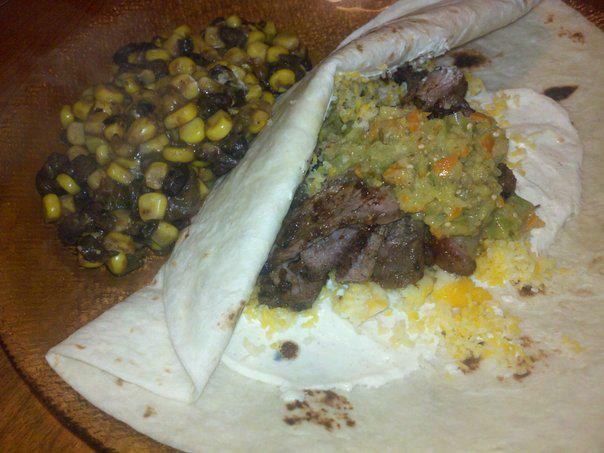 I fixed some sliced steak on top of that, and finished it off with the corn and bean salad. Fold, wrap, and enjoy! That's a delicious list of ingredients. As you pointed out, all of them would make good options and we don't have to use any particular one if they don't match our preferences. However, I would like to have quite a few of those in any spicy, delicious burrito that I am having. The steak should make it a nutritious meal for students. I like marinating food- both meat and veggies. This should be delicious.